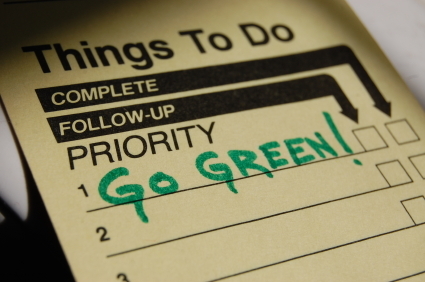 Top 3 Reasons to HATE “Goin’ Green"
Add one more to the “Things We’re Sick Of Hearing About” category. Already in there are celebrities having babies, athletes in handcuffs and politicians screwing somebody (literally and figuratively). What’s next to be thrown onto that ill-regarded pile? Goin’ Green. That’s right, I said it. Take your hybrids, rubber playground mulch, CFL bulbs, and solar panels and shove ‘em all in the giant recycling bin labeled “PAPER ONLY” sitting in your local grocery store parking lot. I’m not the least bit opposed to saving the planet. As a matter of fact I’m ALL FOR IT (remember, I’m in the green product business myself). And when there is a green alternative for the non-green product I am shopping for I really want to give it a try. However, in my possession at this moment I have a box full of green pens (black ink, green manufacturing) that work about as well as a hammer and chisel, a 23-pack of green toilet paper (threw the 1st roll away immediately after enduring a 1st degree cardboard burn over a significant portion of my posterior during the maiden voyage), and a handful of corkscrew fluorescent light bulbs I promptly removed from my house when discovering that when watching TV in my living room I had enough lumens to perform gall bladder surgery. BOTTOM LINE: See Jimmy Buffet’s Cheeseburger In Paradise VS a tofu burger. There are some great green products out there that are as good as if not better than their non-green counterparts, but the reality is that they are few and far between. Few Americans snub the thought of making environmentally friendly choices but until the majority of our green products are equivalent replacements, STOP SHOVING THEM DOWN THE COLLECTIVE THROAT OF THIS COUNTRY. Because I do manufacture an eco-friendly product I try my best to support other entrepreneurial individuals and companies doing the same. For example, I ship my product in small recyclable cardboard boxes so I’m thinking not only should I use a box that CAN be recycled (which I do), I should also use one that has ALREADY been made from recycled materials. Great THEORY, eh? When the rubber meets the road the non-recycled cardboard is about 1/3rd the cost of the recycled version. You do the math. Oh, and how about the recycling bin for my home? The local recycling company wants me to separate all of my stuff (no problem), wash it out (ok), put it in the plastic bin (got it), drag it to the curb on Tuesday morning (uh huh) and then PAY THEM to take it away, recycle it and sell it for a profit. I’m no rocket scientist but isn’t that double dipping? BOTTOM LINE: Green products & programs won’t really become mainstream viable until they make sense financially for the CONSUMER. To those of you who gladly pay premiums for sub-par green products and programs under the heading of “it’s worth it for Mother Earth” I truly applaud your efforts (I do the same). However, if we want green to reach the SUV-driving suburbanites we’re going to have to meet them at a place near and dear to their hearts – their pocket books. Why do we as a country embrace NetFlix, Google, and Fandango? Because they all take something we were used to doing the hard way and make it easier. Their reward, adoption by millions. Thus far, however, almost everything green requires us to go out of our way. I have to drive across town to the organic food store, load up my cans, bottles and newspapers that I’ve been collecting in a corner of my garage for 3 months and take them to the recycling center, search endlessly online for green toothpaste, mouthwash & dental floss – I could go on. BOTTOM LINE: If we want the nation to go green with us we need to make it not just a good thing to do, but a CONVENIENT thing to do as well. On of my favorite companies is Southwest Airlines. They have a GREAT PRODUCT, it’s PRICED BETTER THAN THEIR COMPETITORS, and they MAKE THE USER EXPERIENCE WONDERFUL. Contrast that to most of our green products that are 1. Inferior, 2. More Expensive and 3. Harder to Use or Acquire than the non-green version. Good Ole American economics says that one of those two models is a sustainable movement while the other is a fad that will eventually dry up and blow away. None of us want the momentum of today’s environmental consciousness to die. How do we avoid that? We become dedicated to creating green products and services that are superior, better priced and more convenient. BOTTOM, BOTTOM LINE: Either we get green goin’ in the aforementioned direction or goin’ green is gonna be goin’ out of style. About the Author: Andy Sperry is a Geologist by education, former Environmental Consultant, and the founder and owner of InkFlip.com, a supplier of discount remanufactured (refilled) printer ink cartridges. InkFlip.com offers recycled ink cartridges that meet or exceed OEM specifications, prices that are up to 70% less than big box retail stores and the convenience of their never-run-out program where empty cartridges are mailed from customers to InkFlip.com in a pre-paid box, refilled and returned to the customer immediately. http://www.InkFlip.com – BETTER, FASTER, CHEAPER. « Monday Morning Green Blogoshpere Love! My wife is big into recycling – her heart is in the right place but things need to change on a very basic level – recycling is just a band-aid. Thanks for telling like it is. I bought some expensive “green” spray cleaner that works about as well as plain water. It just sits in the back of the cupboard. Environmental protection at expensive costs. I thought recycling is able to reduce costs. Yes, with the raw material but the processing is one expensive technology. There’s the rub. It is the price that gets me. I do not understand why they cost more since they do not need the raw materials to make them. Some are not really conscious this but though it’s hard we should really try our best to cooperate for the future generations. Wow – this article is actually a breath of fresh air…it is nice to see that someone is telling the current truth about “much” of the green movement. I have noticed that green office supplies, green clothing and green food is noticeably more expensive, and that is something for the eco-conscious consumer to consider. I guess we all have to do our research and decide what we are willing to pay for – Stoneyfield Farms has a superior yogurt that is all natural – am I willing to pay $3 vs. $2 for another inferior brand? Yes, usually. But only because I have educated myself and looked to see what the company stands for – and the yogurt actually tastes better than any other yogurt I have tried! I love bringing eco-friends together – come join us at Global Force Network social community – its free to join and we would love to get to know you too ~ see my blog at http://www.bestlifepossible.com for details.